Wildlife Research and Management Pty Ltd provides support to community groups, NGOs, mining companies and government to deliver effective biodiversity solutions. 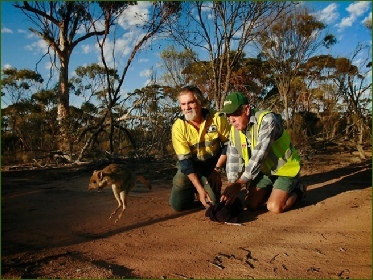 Our emphasis is on understanding threatening processes that impact on our native fauna and in working with local community groups to provide practical on-ground outcomes such as improved management of remnant vegetation, the design and construction of vegetation corridors, and effective predator management to protect native species. Key skills of staff include the demonstrated ability to develop and implement funding proposals to government and regional NRM groups on behalf of or in partnership with community groups and NGOs; project design, literature review and synthesis, analysis and review of complex biodiversity issues, survey design, field survey, use of GIS and remote sensing to further biodiversity goals, and predator management. control of feral cats at key nodes of activity in the southern WA wheatbelt. Jeff Short and Narembeen community member Brian Price releasing a woylie at Wadderin Sanctuary, Narembeen. (Photo courtesy of Vanessa Hunter, The Australian).